I am using iTunes 12.5 on Windows 10 with an iPhone 5s. Sometimes I download hour-long .mp3 files that I want to put onto my iPhone as podcasts, so that it automatically remembers where I am in my listening if I have to stop in the middle. I know how to transfer .mp3 files to my iPhone, where they show up as Music. 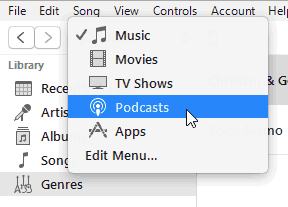 I also know that I can right click on any song, choose 'Get Info' and under Options change the media kind to 'Podcast.' But when I change the file to a podcast, it disappears from iTunes, though it does show up on my device when I open the Podcasts app. How can I transfer an .mp3 file to my iPhone as a podcast, and still have that podcast show up in iTunes when I look there to see what podcasts are on my device? First connect your device to your computer and open iTunes. Go to the iTunes Library. If you don't see the Library option in iTunes, you can get there by clicking on the 'Done' button in the lower right corner (if it's there). In Library, click on the File menu, then select Add File to Library... Browse to the .mp3 file you want to import as a podcast, and choose it. This file will now show up in iTunes Library under Music. Right-click on the "song" and choose Get Info or Album Info. Make sure the file has a "song" title and an album name. (Optional: change the genre to 'Podcast'. Also optional, add artwork if you want.) Under the Options tab, change the media kind from Music to Podcast. Now click OK at the bottom. The "song" will now have disappeared from Music. Change the Library over to Podcasts, and you should now see the file there. The final step is to right click on the (now podcast) file and choose Add to Device (your device is connected, right?) and select your device. Voilà! The .mp3 file is now a podcast that shows up both in iTunes for your device, and also in the Podcasts app on your device. Not the answer you're looking for? Browse other questions tagged itunes windows podcasts mp3 . On iPhone/iPad, can you view a PDF sync'd in iTunes? Separating podcast mp3 files from music files? How do I recover files that vanished because I marked them as “podcast”?